Tonight "anarchist" urban geographer Matt Coolidge from the Center for Land Use Interpretation gave an informal talk about an ongoing work that CLUI has been invested in right here in the SF Bay. CLUI is "a research and education organization interested in understanding the nature and extent of human interaction with the earth’s surface, and in finding new meanings in the intentional and incidental forms that we individually and collectively create." They operate from locations in Los Angeles and Houston as well as Wendover, Utah, Troy, NewYork, and a Desert Research Station in the "hinterland" of the LA Basin. (The residency that they offer in Wendover sounds like a particularly appealing alternative to a job-starved market…) They do other cool stuff like bus tours to interpret desert landscapes or, most recently, oil derricks in the LA basin. 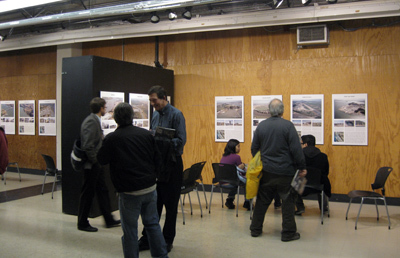 On view on the 1st floor of Wurster Hall is an impressive array of photography and information focusing on deindustrialized and demilitarized space at the edge of the Bay. There are 50 sites in the study, moving from Mission Bay to Treasure Island (the long way). 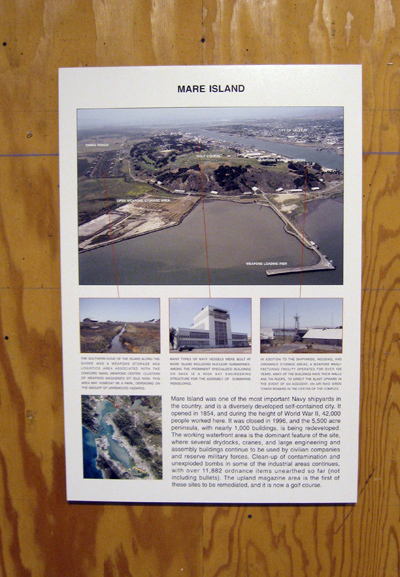 The exhibit is especially exciting to me because many of these spaces--Alamada Naval Station and Treasure Island chief among them--formed the inspiration for my big trip. But there's even more that gave tonight a strange feeling of a homecoming. Michael Dear gave the introduction for Coolidge. 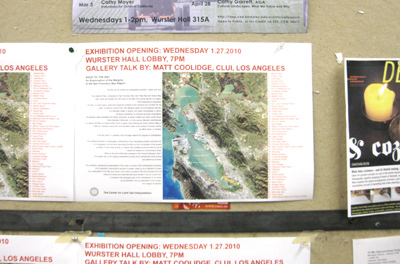 Dear has recently joined the Urban Planning faculty and is teaching a graduate course on LA this semester. He is someone whose work I have been familiar with since my USC days. His reading of Los Angeles as an expanded border zone helped to form the theory base that supported my undergraduate thesis, which was looking at the edge of East LA as it met the industrial pocket surrounding the LA River. Coolidge's work I was only indirectly aware of while at USC, but retroactively I am realizing how much his investigations into massive infrastructures like the LA River kindled my own desires to find a lens for viewing these spaces. With Dear in attendance, the whole evening had a ring of LA-River abandoned industrial edge-inspired gazing. It is encouraging, actually, that much of what excites me about Los Angeles can also be seen here in the Bay. And the ecology is simply more visible here--the intersection between man and nature, read in point form along a 400-mile-long watery edge. CLUI's work on display here in Wurster Hall is very impressive. It is completely unencumbered by fancy graphics or over-elaborate mappings. There is no gloss to the panels, literally and metaphorically. What you have in front of you is an aerial view acquired for each of the 50 sites from a Cessna airplane, a series of first-person perspectives, and a rich body of text that warrants concentrated study. For anyone who is passionate about these kinds of spaces, you couldn't ask for more. 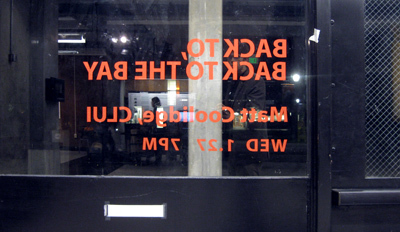 The Bay can be viewed as a geographic paradox: a place and a void. The collective "Bay" (composed of San Francisco Bay, San Pablo Bay and Suisun Bay) both unites and divides the community of the Bay Area, giving identity to a region, while separating its populace… Once intensely militarized, it is now, just as intensely, demilitarized. In a sense, the Bay is a natural entity, borne of great rivers draining the entire Central Valley of California, however, every inch of its shoreline today is the product of human activity, by either intent, or incident. If the Bay itself is a paradox, then its edges delimit the margins of contradiction.